Richard Gibbon Westmore applied for a spirit licence Tuesday 23rd August 1870 for his COMMERCIAL HOTEL. He said it was mainly for those staying at the hotel. Granted. and as the ROBINSON HOTEL in 1883 and 1889. 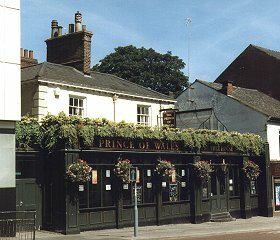 Found as the PRINCE OF WALES or PRINCE OF WALES HOTEL from 1875. Address as No 8 in 1896, 5/6 in early 1970's and as 4/12 in late 1970's. Main structure is late 17th C.
Ground floor extended and completely modernised, probably during 1960's. Original facade visible at first floor level. Interior completely modernised within the last few years. Large, one-bar, city centre pub.